Readers of the blog will be very aware that I spend most of my time in the past, writing about London’s history, and unlike may other blogs I do not explore future plans for London and the many exciting developments in transport and architecture. Today is an exception, and for an extra post on the 1st April, I have a scoop that I have not yet read about anywhere else. A couple of week’s ago I was at the end of a walk from Deptford to London Bridge and had stopped in one of the well known coffee chains that frequent the area. I had sat down at a table, drinking tea, looking through the photos on my camera, and started to hear snatches from a rather loud conversation on an adjacent table. Around the table were six smartly dressed people, who I gathered were from a construction company and an architectural practice. They were about to give a presentation at City Hall, and in a text book example of why you should not discuss confidential business in a public place, they were doing exactly that. The words that caught my interest were Brexit Bridge, followed by New London Bridge. I now had a challenge to make my almost empty cup of tea last much longer so I could listen in to the discussion, and this is what heard. The team was about to present their proposals for a new bridge across the Thames and were having a final run through of their presentation, and looking for anything they may have missed to make the presentation, and the proposal for the bridge, more compelling. The proposal was for a new bridge across the River Thames in the same location as originally planned for the Garden Bridge. Where the bridge would differ from the Garden Bridge is that it would be a much larger copy, with modern materials, of the earlier version of London Bridge when the bridge was lined by houses. The working name for the project was officially “New London Bridge”, but the team were discussing that the Brexit Bridge would have been a great alternative for the previous Mayor, with an alliterative name, and the option to put his first name at the beginning. The new bridge would stretch from the South Bank to the Temple underground station and would consist of eight storey houses on either side. These would use modern materials for strength and durability, but from what I could make out of the design from their conversations, would emulate the appearance of the earlier London Bridge. The bridge would not be open for traffic, pedestrians only and to emulate bridges such as the Ponte Vecchio in Florence, the ground floor would be lined with shops. They expected considerable demand from all the expensive international brands hoping to get a store in such an iconic landmark. So no public money, or private donations would be needed. The team had also considered other objections to the Garden Bridge and part of their pitch was that the, and I quote “heritage lobby”, could not object as the bridge was a recreation of a historical bridge that once crossed the river. I continued to listen (pretending to drink from an empty cup and looking through my photos for the 10th time) as the conversation seemed to get increasingly far-fetched. They also discussed options for other uses for the bridge, and how potential purchasers could be better served (and charged more). The team finally packed aware their laptops, and with a final few motivational encouragements, headed off to City Hall to make their presentation. 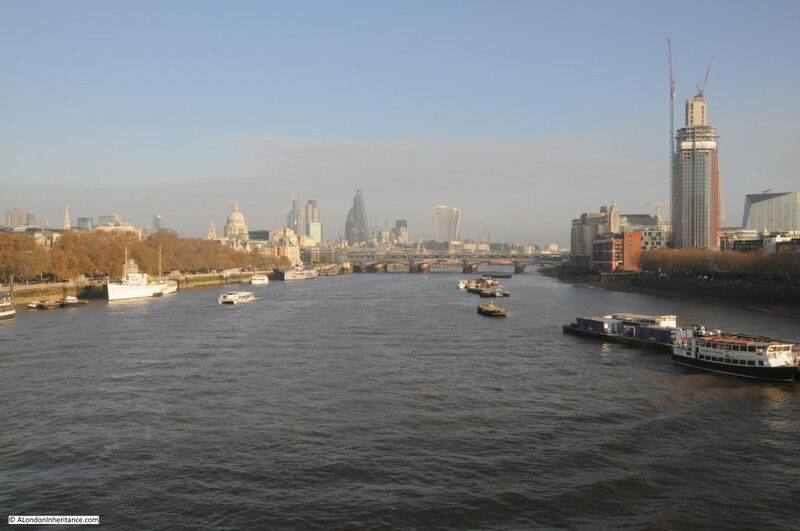 The site was chosen as to redevelop the existing London Bridge was not viewed as an option as the bridge was a key traffic route between north and south banks of the river. The proposed location was also wider than the central City location, so could accommodate more apartments and therefore generate a greater return to cover the costs of the bridge and profit for the investors. The location of the bridge will be across the river in the middle of this photo (only taken a few years ago, but surprising how the City has since changed). The above is my attempt for April Fool’s Day, but there is a serious element to it. The more I thought and wrote about such a bridge, I more I thought that this could actually happen. The city is growing at a very rapid rate. I took the above photo in December 2014, and less than five years later the number of towers in the City has grown considerably. Buildings that previous generations could never have imagined have been built across London, and their geographic spread, height and design variations seem to be growing on a monthly basis. The function of areas of the city have also changed considerably – the Isle of Dogs was once devoted to industry and the docks. These disappeared within a generation to be replaced by offices and apartment blocks which continue to be built and spread in area and height. London has always changed, and what we see today is only a snapshot of the city, a view that is different to yesterday and will be different tomorrow. I have a theory that our baseline of London is from when we first encounter the city. Mine is from the 1970s, and I still reference changes to what the city was like then. We took our granddaughter up to the Skygarden a few months ago, and she loves the building and the view – this is part of her baseline of the city, where I would consider the building in relation to what was there before and the impact that buildings like this have had. The city will therefore be very different in the future. Buildings we cannot imagine now will at some point grace London’s skyline. London appears in one of the Star Trek films (Into Darkness) where St. Paul’s Cathedral is surrounded and dwarfed by towers that rise in all directions (see 26 seconds into the YouTube extract which can be found here). This view seems very plausible for the future given the current trend in building. I have no idea whether a New London Bridge, lined with apartments will ever be built, but with money and the right connections, I am sure there is very little to stop such a construction. If it does ever get built, just remember that you heard it here first. This entry was posted in The Thames and tagged River Thames on April 1, 2019 by admin. Love this. My 8 year old inner self enjoyed the (simulated – spoilsport!) heads on spikes. But you’re right the previous mayor would love a Brexit bridge although – serious point here – a bridge can and should be an opportunity to join rather than commemorate division. Perhaps that IS a way forward! I’d love to reserve one of the apartments for when I win the lottery! Quite brilliant. You get my vote in the forthcoming mayoral election. Peabody Trust in the late 1990s had an exhibition at the RIBA I think, which had a proposal for a ‘living bridge’ across the Thames. I think the idea wasn’t taken forward because, at the time, the Corporation of London didn’t support the idea. Somewhere all the architect’s models must by lying about. So maybe not so fanciful! It’s a good joke – but the ‘garden bridge’ was a truly horrible idea. My objection was on aesthetic grounds: views up and down the river from waterside paths would have been blocked by trees and shrubs. These are hard-edged, intensely urban scenes that do not need ameliorating with pretty plants. London is actually one of the greenest capital cities, with plenty of parks, squares and gardens. The bridge was conceptually wrong – and we London tax payers are footing the bill: millions wasted on architects and advisers. You had me there for a moment ! You are right about londoners establishing their baseline view according to their first acquaintance with the capital. Mine began when work began on the foundations of the Post Office Tower and Centrepoint. I think the Hilton Hotel on Park Lane was the tallest building before then and I remember great play being made ot the fact that its top floor rooms overlooked the gardens of Buckingham Palace. Alas, I have never been able to verify this for myself. Yes and without discussing bridges your theory that our conceptual baseline for our own ‘personal’ London consists of how we first came to know it is quite true: I still visit China town, the circular French church on the corner of it as well, and Harrods all in one day in middle age as when my sister and I were taken there like that as children fifty years ago. Well done! I was deep into the article and laughing at the grandiose ideas and schemes of others….. And then I remembered what day it was. Not thinking about the date, I was taken in. It all sounded horribly plausible and of course since I first joined your group(ies), I have learned to respect your command of history (and facts)! Well done! I was getting quite excited about heads on spikes as a tourist attraction -good spoof. Excellent. I am a member so look forward to reading.